A growing category of window covering options includes window shading and sheers, offering the ultimate in light control and privacy. Their versatility can provide complete privacy without complete darkness by simply adjusting the vanes for the desired amount of light. 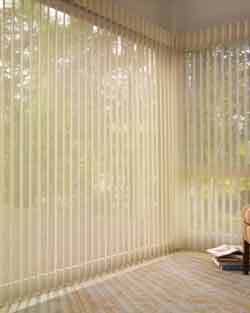 Shadings and sheers are made with a wide selection of soft fabrics including opaque and translucent materials.